I was going to start this edition with some of my go-to recipes. Then I realised that for some of my readers, the basics, the things for which seasoned home cooks come naturally and take for granted, are often lost. For those of you who quote "don't even know how to cook an egg" but want to, here is my gift to you! Complete, step-by-step instructions on how to cook one of the world's most versatile ingredients. When cooking eggs, use eggs that are as fresh as possible, ideally bought the same day, as the older the egg, the harder it will be to prepare, and the worse it is for you. If the egg is REALLY old, DON'T EAT IT! It could kill you! How do you tell if an egg is still good? Put it in a bowl of water. The level of the water should ideally be 2 times higher than that of the egg. Fresh eggs will sink and lie on their sides. Rotten ones will float. According to Chef Martin, another way of telling is to crack the egg open and take a look. 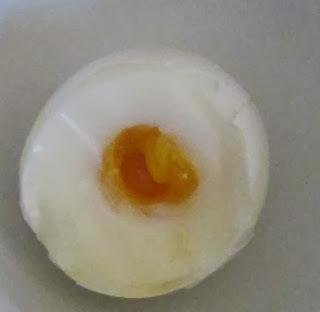 If the white is very runny and not cohesive around the yolk, the egg is technically edible, but old. The egg is fresh if the egg white is gelled, not runny, and will hold together around the yolk. Due to the versatility of eggs, there are tons of recipes and cooking methods, and as a result, I have split this article into a few parts, for as we all know, the human attention span is quite short, and I want you to keep reading. 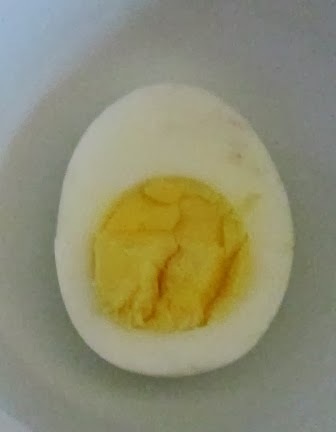 A boiled egg is an egg cooked in the shell. It is the easiest way to prep an egg, and probably the most healthful. There are two types of boiled eggs: hard boiled, meaning both yolk and white are solidified through cooking, and soft boiled, where only white is solid and the yolk is liquidy. Soft boiled eggs sometimes need to be served in the shell, hence the use for those cute egg holders. The latter should be eaten with a small spoon or a strip of bread, in order to avoid a mess. 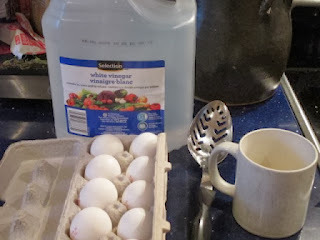 Put the egg in the small pot and pour in enough cold water to cover it completely. Bring the water to a boil (meaning the water has big bubbles that rise from the bottom causing waves). Lower the heat and simmer (meaning the heat should be on just high enough to keep the water bubbling). It takes 3 to 4 minutes to make a soft boiled egg. Three minutes for a runny yolk, and 4 for a slightly cooked yolk. 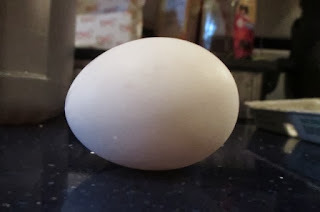 A hardboiled egg takes more time: about 5 to 6 minutes. 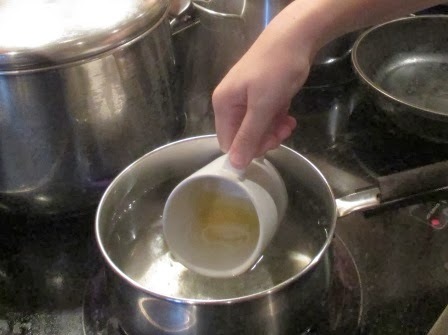 Once the eggs are ready, take the pot off the heat and immediately pour cold water over them. This not only cools them off, it also helps to separate the eggs from the shell and keeps an ugly gray-green film from forming around the yolks of hard boiled eggs. Once they're done, peel off the shell if hardboiled, or put in an egg cup and cut off the top or pell off the top of the shell (this make take a few tries before you get it right without destroying the egg) if soft-boiled, and enjoy! A poached egg is a soft boiled egg cooked out of its shell in water (though I heard the Romans sometimes did this in red wine). This is another one of the best ways to prep an egg as it requires no cooking fat, and allows the egg's flavor to stand out in all its glory. 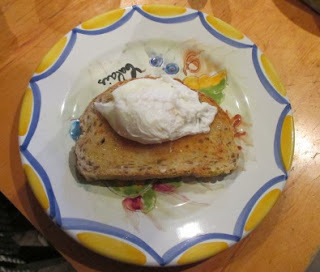 Like a fried egg, you can put a poached egg on just about anything such as toast, an English muffin, salads, and steak. It is the form of egg cookery required for Eggs Benedict. Please note that if you don't like a runny yolk on your eggs, this isn't the recipe for you, as the perfect poached egg is a runny yolk surrounded by a slightly solid white. Put the vinegar and about 2 cups of water in a pot and bring it to a bubbling boil. While the water is heating, crack the egg into the coffee mug. Once the water has huge bubbles, causing it to produce waves, gently put the egg filled mug halfway into the water and tilt it sideways, getting a little boiling water in the mug. Be careful not to burn yourself when you do this! As shown in the picture below, the handle of the coffee mug should be facing upward when you put it in the pot. Put the mug on the counter for a few of seconds, and then put mug back into the pot and tilt it sideways, allowing the egg to slide out of it. Let it boil for 2 1/2 to 3 minutes. When the white is no longer clear, carefully scoop the egg out using the slotted spoon and put it on top of your dish of choice. There are three types of fried egg: sunny side up, over easy, and hard done. 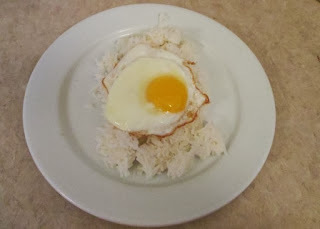 Sunny Side Up means the egg has only been cooked on one side in the frying pan, and as a result, the yolk will be more or less raw, and the white slightly cooked. This is not only pretty if you get it right, but it is perfect for people who love runny yolks to dip their toast in. According to Food Network Magazine, you can put a fried egg on just about anything from steak to Caesar salad to nachos! Over Easy is for people who like a runny yolk, but want the egg cooked more, and don't care too much about how it looks. Think of it as the difference between have a steak rare, and having it medium. Please note that if your eggs aren't fresh, DO NOT EAT THEM WITH A RUNNY YOLK! You do not want a tummy ache or, without getting TOO graphic, worse! Hard Done is exactly what the name suggests, namely, that both yolk and white are fully cooked. 1/2 Tablespoon Canola Oil OR 1/4 tablespoon Butter or Margarine and 1/4 tablespoon Canola Oil - Do not use Pam unless or other cooking spray unless you are extremely health conscious, for while it does allow you to use less fat, it makes your egg look plastic. Before cooking, let the egg rest on the counter, un-cracked for about 5 minutes. According to Chef Martin, if the egg is too cold, the yolk will break whether you want it to or not. Put your pan on the stove and dump in your fat of choice. Heat your pan to medium heat. The pan is hot enough when if you lift it off the stove, the fat slides easily around it, coating the bottom. 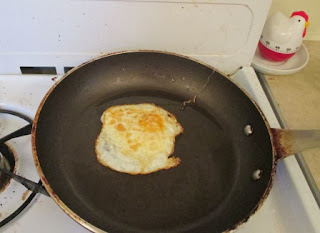 Crack your egg into the pan, and wait. When the clear part of the egg (or white) is white and solid, and the edges are ever so slightly brown, carefully, without breaking the yolk, slide the spatula completely under the egg and lift it out of the pan. The success of this depends on how well greased and new your pan is, as well as the cleanliness of your spatula. You want both to be as clean and/or new as possible, as those nasty plasticky bits on the end of a plastic spatula can interfere with the structural integrity of a fried egg as you remove it from the pan. You can then put it on anything you wish! 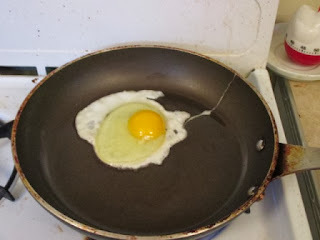 Follow the exact same directions and using exact same equipment as for a sunny side up egg, however, when the time comes to remove the egg from the pan, flip the egg over by turning the spatula upside down and letting the egg drop back into the pan. Wait about 10 to 20 seconds, and then take the egg out of the pan. It's a proper Egg Over Easy if the underside is slightly cooked, but the yolk's still runny. Making an egg hard done is almost exactly the same as making an egg over easy. The only thing that changes is the cook time. Instead of cooking the egg on the other side for a few seconds, cook it for about a minute and a half before transferring it to your plate. It's a proper hard done egg if both white and yolk are fully cooked. This is easier done if you break the yolk after first cracking it into the pan, and it cuts the cook time by about half.